It looked like Revenge might be cancelled due to mediocre ratings last May. ABC gave the TV series a renewal instead, likely in part because the network’s other new dramas didn’t perform as well. Will Revenge’s ratings fall lower this season or will this nighttime soap’s numbers rise instead? 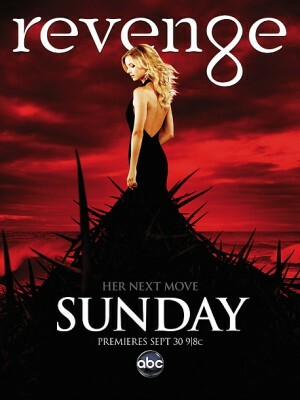 The second season of Revenge typically airs Sunday nights on ABC. The network has ordered 22 episodes. The cast includes Emily VanCamp, Madeleine Stowe, Henry Czerny, Joshua Bowman, Christa B. Allen, Gabriel Mann, Nick Wechsler, Connor Paolo, and Ashley Madekwe. Here are the TV show’s ratings for the 2012-13 season, the best way to tell if Revenge is going to be cancelled or renewed for season three. Final season averages: 2.2 rating in the 18-49 demographic with 7.02 million total viewers. 1.7 in the demo (-6% change) with 6.12 million (-3% change). Season averages: 2.16 in the demo with 7.02 million. UPDATE: ABC has renewed this show for a third season for 2013-14. 1.8 in the demo (+6% change) with 6.28 million (+4% change). Season averages: 2.18 in the demo with 7.07 million. 1.7 in the demo (+13% change) with 6.05 million (+10% change). Season averages: 2.20 in the demo with 7.11 million. 1.5 in the demo (-17% change) with 5.49 million (-13% change). Season averages: 2.23 in the demo with 7.17 million. 1.8 in the demo (0% change) with 6.31 million (-4% change). Season averages: 2.27 in the demo with 7.27 million. 1.8 in the demo (-10% change) with 6.57 million (-6% change). Season averages: 2.30 in the demo with 7.33 million. 2.0 in the demo (+11% change) with 6.96 million (+16% change). Season averages: 2.33 in the demo with 7.38 million. 1.8 in the demo (+29% change) with 5.99 million (+15% change). Season averages: 2.36 in the demo with 7.41 million. 1.4 in the demo (-18% change) with 5.20 million (-10% change). Season averages: 2.40 in the demo with 7.52 million. 1.7 in the demo (-15% change) with 5.75 million (-7% change). Season averages: 2.48 in the demo with 7.71 million. 2.0 in the demo (-17% change) with 6.17 million (-13% change). Season averages: 2.55 in the demo with 7.89 million. 2.4 in the demo (0% change) with 7.12 million (-7% change). Season averages: 2.61 in the demo with 8.06 million. 2.4 in the demo (+9% change) with 7.65 million (+11% change). Season averages: 2.63 in the demo with 8.17 million. 2.2 in the demo (-12% change) with 6.92 million (-11% change). Season averages: 2.66 in the demo with 8.23 million. 2.5 in the demo (-7% change) with 7.73 million (-3% change). Season averages: 2.73 in the demo with 8.42 million. 2.7 in the demo (0% change) with 7.94 million (-3% change). Season averages: 2.77 in the demo with 8.54 million. 2.7 in the demo (-4% change) with 8.18 million (-6% change). Season averages: 2.78 in the demo with 8.65 million. 2.8 in the demo (+8% change) with 8.71 million (+5% change). Season averages: 2.80 in the demo with 8.77 million. 2.6 in the demo (0% change) with 8.28 million (-1% change). Season averages: 2.80 in the demo with 8.79 million. 2.6 in the demo (-19% change) with 8.36 million (-14% change). Season averages: 2.90 in the demo with 9.05 million. 3.2 rating in the 18-49 demographic with 9.74 million total viewers. Season averages: 3.20 in the demo with 9.74 million. Year-to-year, the season debut of Revenge was down slightly from the series premiere, by 3% in the demo (vs a 3.3 rating) and down by 3% in viewership (vs 10.02 million). These were the highest numbers since last year’s premiere. A very positive start. Reference point: The 2011-12 season averaged a 2.5 rating in the 18-49 demographic and 7.82 million viewers. What do you think? Do you still like the Revenge TV series? Do you think it should be cancelled or renewed for a third season? Revenge: Is It Time for the ABC Show to End? Please don’t cancel Revenge. I never fail to watch Revenge episode after episode. I was so shocked by the news it will be canceled. Are you sure the reported rating is accurate? It is unbelievable. The show is intelligent and the actors are great. Revenge is well produced and first class. Please do not cancel! I would like to see it continue to the 5th season and beyond. I love Revenge. I hope it doesn’t get cancelled. Wasn’t aware of the show until recently. I bought the season pass on utube. I will very disappointed if it gets cancelled. I have been binge watching seasons 1 thru four so I will be up to date when it comes back in March. Used to be one of my top shows but it’s slipped. I still watch but am disappointed with the story line. The French woman adds nothing in her relationship with Jack and I find it annoying. Emily is now being betrayed as a shrew and hard to warm up to. I’m sure WRITERS that it was false that Emily could not have children. Warm up the characters or you’ll lose me. My husband and I enjoy the show but it seems to be dragging on too long. Waiting for the final season to be announced.